Stanford Wong was born in 1943, and it's actually his pen name which he uses for publishing books. His real name is John Ferguson, but it's almost not known because all of his famous books and articles which are popular worldwide go under the name of Stanford Wong. The most popular probably is Wong's book "Professional Blackjack", which is still in print since first published in 1975 and has a huge number of fans and followers. In fact, Wong himself is a famous blackjack expert and has appeared many times on TV as a tournament challenger or just giving professional advice. In his childhood Wong describes himself as an extremely curious and talented child, who was always ready to solve some kinds of puzzles, problems and thinking games. When he turned 10 years old, he began to feel interest towards blackjack. He remembers how he used an office calculator and tried to figure out the odds of a player, playing blackjack with himself. As he remembers, the push which made him study card counting strategies, was given by Edward Thorp's book "Beat the Dealer", which fascinated him as hard as it was possible. His genius turned onto blackjack and he saw in it not just cards and luck, but a difficult mathematical problem, which can be solved. And the more complex and difficult the problem is - the more interest it gave to him while solving it. While getting his doctorate in finance Stanford Wong was teaching students simultaneously at San Francisco State University. Approximately on that time he was seriously involved in blackjack gambling, because it was the game he could not forget and which he was trying to beat since his childhood. It was 1964 year and Wong was already making money using his perfect skills of blackjack, which were sharpened and improved constantly. Also Stanford Wang is popular for his own method of advantaging in Blackjack. It is expressed in mere game watching and not betting actually, but counting cards of those people who are actually gambling. And when the odds grow and bend on the player's side, the watcher enters the game and wins money easily, due to the fact that the odds are on his side. This cunning strategy appeared to be quite efficient but the casinos made a counter-measure: you can often see that it is written on the tables that a side player may only enter the game as the "first hand" after shuffling. One of the famous Wong's achievements is a personal Blackjack analyzer - a computer program which is used to count odds in blackjack game and give tips to the player - whether to hit, to stand, to double or to split. Stanford Wong is a living legend and is one of the original members of blackjack Hall of Fame. Know the 7 names of blackjack card game legends which form a 21 Hall of Fame. 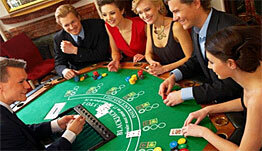 Being an online blackjack gamer - make use of blackjack artists life experience and play well. Best players of the world open their minds and share their bio facts.